Over 50 kids participated in the 7th Annual Ranch RoundUp July 9th, 10th, and 11th at Walnut Bend Farm. This faith-based day camp was created by Mark, Ann and Landon Dalton, good friends and customers of Foster Fuels Inc., to give children the opportunity to experience ranch life and the outdoors in a safe and fun environment while providing a way to minister to the local community. Each summer there is a word theme, which is taught to the children. This year’s theme was “Hope”. Seven years ago, the camp was held to just a handful of children. However, due to generous sponsors and numerous volunteers, the camp has grown into more than they ever imagined possible. The Dalton’s look forward to hosting camp each year to children ages 5 through 15. This three-day camp begins at 8:30 in the morning going until 2:00 in the afternoon with a range of activities available including; horseback riding, steer roping, fishing, lessons in beekeeping, rifle safety, devotions, archery, livestock care and much more. The kids also enjoy an ice cream social and chuck wagon cookout. 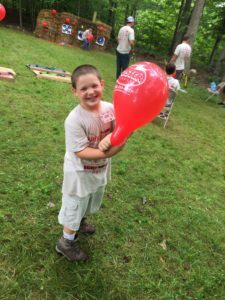 For this year’s event, Foster Fuels helped sponsor the “RoundUp” as well as provided crayons and balloons for the campers to enjoy. Plans are already in the works for next year’s event. A bull rider with a local Rodeo Company is planning to attend. In addition to the current activities available, the Daltons are working on other Ranch and Outdoor lessons to be added. If you are interested in learning how to enroll your child in camp or want to find out how you can help volunteer for next years event please email Ranch RoundUp founder, Ann Dalton at Daltontitle@yahoo.com. Very professional, hard working, and excellent to work with.